Does anyone else ever get those times when they fear they've bet on the wrong horse, per se? I occasionally wonder whether I was right to put all my points into the arts. Its a wonderful subject and an excellent tool for studying the progression of human culture through time but then thats all literature and cinema really are, as well as, of course entertainment for the masses. Every now and then Ill consider the other options I could have taken in life and feel the occasional sting of regret. How different would things be if Id taken a science into my A Levels? Or maths? I guess theyre not things Ive always held close to my heart but Ive never been bad at them. Just not all that motivated. Would I have been able to stay interested all the way through the two years necessary to get a halfway decent qualification in them? Its really just curiosity I guess. Maybe I should stop watching so many documentaries about the workings of our universe or reading so many novels that praise the power of mathematics (Curse you The Devotion of Suspect X for planting the seed of doubt). And theres nothing to keep me from doing that. Theres no reason I cant pick up some books on the subjects I want to learn about next time Im in Waterstones, and then revise from them to the point where I can recite each one word for word until Im blue in the face, but then what would be the point? It gives me the power to say that I can do so but my knowledge will always be lacking. Compared to a student of Physics, itd be laughable to say that Im knowledgeable on the subject. Of course, the reason for my wondering is that Im unsure if its too late to change the direction of my life. Im on my way to finishing my A2 levels and with any luck, next year Ill be well away to University wherever thatll be and my only option for any of those will be related to Literature, English Language or Film Studies. And theyre ultimately all rather similar. It would appear that unless I abandon ship and spend the rest of my life working in a shop then I am destined to have a job in either the media or the arts, both of which are tightropes underneath which is a net filled with likeminded people who thought they had a chance to make it. Im interested now in other subjects but at this stage its far too late. I may want to study Physics but Ive already thrown in my lot. I may want to fill my head with formulae and equations but in the end theres little to no point as any hypothetical degree I receive in University, should I make it, will always say English and thats what everyone will read. But I guess this is just related to a problem of my own. My English Language teacher (Not the one I refer to as the ice queen, who informed me I have no chance) reported a similar concern once, though not for as overarching a subject. They said that I have a tendency to spread myself too thinly across too many subjects and there certainly is no way for me to deny this. Its the same tendency thats inspiring me to improve my drawing skills (which isnt going that great, thanks for asking), to learn how to play the piano and even to simply train my left hand for writing. The same tendency that makes me want to study politics, law and classical history. That makes me want to continue learning French, Spanish and Japanese until I finally understand how I'm meant to hold an entire second language in my head. I distract myself with aspirations and when I realise theyre fruitless goals I grow frustrated. In other news: Oh bugger, I think the depression symptoms of my medication are kicking in. There is nothing more frustrating* than when you're dreaming or just really deep in thought and everything's really interesting, then something jolts you awake and you instantly lose hold of whatever it was. And you try and try to grab it again, but like a helium-filled balloon on a string, there's barely enough to grasp and it slips out of your fist into the great blue beyond. And you know it was interesting and you want that balloon back but by this point it really is nothing more than a speck on the horizon and you know you'll never see it again. This is yet another reason why falling asleep on the bus angers me. It always happens. I think I need a new ringtone, anyway. No longer in the cold grip of Apple, I found I could make any song I wanted a ringtone so naturally I went for a song from the Solatorobo soundtrack. Roll'n Roll'n, naturally which I thought would sound perfect. So there I am, waiting at the back of the line to get my UCAS form finalised when a woman comes up with a huge bundle of papers and asks me to take them to the front desk. There were a lot of front desks. In my confusion I was then surprised to hear what sounded like my music streaming out of my phone, and everyone in the room turns to stare at me while this jovial tune bursts out of my pockets. In my panic I end up dropping the armful, only to find out it was a friend calling to see where I was when he was outside the bloody room. I need something a little manlier for next time I think...heavy metal, perhaps. Maybe Mastodon. *Disclaimer: This is an exaggeration. There are a lot of frustrating things in this world and that is not the worst of them. So my mum just had me sit down and watch a documentary about acne and the new drug I've been put on. They naturally went into a lot of detail about the side effects and ended it with an unfortunate story about one poor lad whose depression got to him and he ended up taking his life. GEE, WHAT A CHEERFUL WAY TO END MY MONDAY. Not that I fear for my mental health on these things. I'm not overconfident, mind, I've just already been in a pretty bad place before so I have experience in consoling myself. And so far the side effects I've been getting have only included incredibly dry lips and a back that protests at the slightest action. Work is gonna be so much fun at this rate. 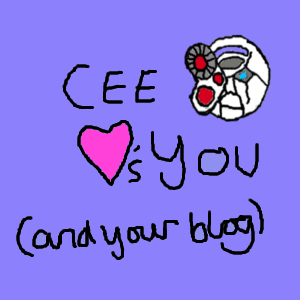 On a more cheerful note...uh...NEW AVATAR! Because everyone else was doing it and we needed a dosage of adorable psycho. Oh, and Steam sale which I've been staying far, far away from. I've been eyeing up The Walking Dead, though. Has anyone else played those games and is it worth it? I'm currently getting really panicky about this. Applying for University is more stressful than one would have imagined. I sent it off yesterday and all that's left is to hand in the checklist but I can't help but get the idea that I've done something wrong. It's likely my fault for doing it so late, of course. The £23 charge annoys me a little, as well. I doubt my chances of standing out from other, better candidates so I feel that I'm just paying for some guy to sit behind a desk and say "Hmm...nah". That phone's incredible though. It's way faster than it has any right to be. I'm loading pages and whizzing around at a rate that my iPhone 4 was struggling to get even close to. I'm...impressed. In a fit of rage today, I flipped an entire box of individual Lindor chocolates across an Asda store because I couldn't find the price, thus making the poor staff member behind the counter pick every last one up. At least, that's probably how it looked. In reality that was just me being a clumsy sod again. See, this is the problem with me being as constantly tired as I currently am. They were 3 for £1 in case you were wondering. I bought six as an apology. And I found a collection of Assassin's Creed graphic novels for buy one get one half price in Waterstones. I didn't even know they did those, but given how eager I am to immerse myself in as much of the AC universe as possible, I snapped them up. Even if they're not that great, at least they'll look good on my shelves.